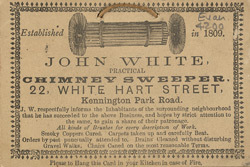 This is an advertisement for John White, Chimney sweeper. Children often worked as chimney sweeps in the early 1800s. In London there was a Society of Master Sweeps, which had its own set of rules to regulate the employment of children ensuring that they did not work Sundays, went to school and read the Bible. Conditions were harsh however and many children died from smoke inhalation or were killed when they became trapped in narrow flues. In 1864 Lord Shaftesbury’s Act outlawed the use of children for climbing chimneys and a £10 fine (a considerable sun then) was imposed on anyone who was caught doing so. Other methods had to be applied and Joseph Glass developed the system of canes and brushes that we recognise even today.